The Nanotechnology Characterization Laboratory (NCL) is collaborating with the Army to develop a candidate vaccine against botulism. Under a collaboration agreement between the National Cancer Institute and the U.S. Army Medical Research Institute of Infectious Diseases (USAMRIID), NCL scientists will produce nanoparticle formulations for four compounds that block the activity of botulism-causing nerve toxins, which are among the most lethal of all poisons. The toxins come from Clostridium botulinum bacteria that can be found in soil and are perhaps best known for contaminating home-canned foods, although rarely. The Centers for Disease Control and Prevention reports an average of 145 cases of botulism each year in the U.S., mostly from foodborne transmission, wound contamination, and infant ingestion. 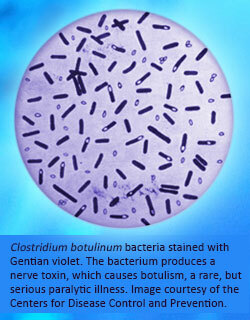 Because of their potency, botulinum neurotoxins are classified as top-priority biodefense agents. The toxins can cause paralysis and respiratory failure, leading to death. Antitoxin given immediately after exposure can remedy ill effects, but there are no preventative agents. USAMRIID has developed four botulinum neurotoxin inhibitors, but these inhibitors have issues with solubility and side effects when used in high enough concentrations to be effective as vaccines. Nanoparticle formulations might make the inhibitors more soluble. That could result in a candidate vaccine because a lower dose could be given, it would circulate better through the body, and more of it would reach its target: the nerves affected by the toxin. NCL scientists would reformulate the four inhibitors and then return the materials to USAMRIID for laboratory testing to determine if the approach is successful. If any of the new formulations are effective, they could move on to clinical testing. The NCL principal investigator on the project is laboratory director Scott McNeil, Ph.D. The Army principal investigator is Robert P. Webb, Ph.D.